Revisit the joy of the Cold War era with this propaganda style lettering. Perfect for video games, books & magazines. Includes 36 bonus alternates. Choose as your free bonus gift with any purchase. Patrick Kalange & the journey of a letter (in this case LHF Nugget) from initial sketch to finished font. Denise Bayers has added a new solid version to her LHF Dark Horse set. This is a useful compliment to the distressed versions and free for customers who purchased before 2/13/19. Please follow these steps for updating your fonts. Inspired by late 1890's American bottle labels, cigar bands and tobacco packaging, this versatile font from Mark Searfoss, combines a unique mix of both decorative and basic characters for added design flexibility. Set includes 7 versions: Regular, Block Shadow, Cast Shadow, Drop Shadow, Lined Inset, Mesh Inset, and Solid Inset. Download this fully hand drawn vector .EPS Alphonse Mucha panel, free with any purchase. Expertly drawn by Patrick Kalange. Includes both outline and colored versions. Select Mucha Panel 1 at checkout. Inspired by old cigar labels and billheads, Patrick Kalange's latest font features 3 versions, Regular, Fancy, and Shadow. Each version contains decorative caps and over 30 bonus alternates. Inspired by old letterpress specimens, LHF Swindler immediately evokes the authentic feeling of the Old West. Mark Searfoss expertly crafted this unique font set with every letter in mind to ensure that overall balance and tone were correct. Download all 3 versions: Regular, Spurs and Weathered, for only $49. Choose 6 or more select fonts for only $33 each. Be sure to take advantage and download as many as you want. Master sign artist Dave Correll has just completed his 22nd font. Type aficionados will appreciate this hand drawn, spurred script set which includes Regular and distressed Historic versions. Denise Bayers' font, Amethyst features large decorative caps with Regular and two Shadow versions. Use the Regular version alone or finish your design with one or both of the Shadow versions. Download this fully hand drawn vector .EPS panel free with any purchase. Expertly drawn by Patrick Kalange. Select Vintage French Panel at checkout. For a limited time, download LHF Desire for only $59 (Reg. $99). This beautiful typeface offers an expansive set of over 700 alternates for the designer, making it the perfect choice for books, magazines, packaging, branding and signage. Plus, download Borges Catchwords 1 for free with purchase. Download this fully hand drawn vector .EPS panel free with any purchase. Expertly drawn by Patrick Kalange. Pieces can be separated as shown to suit your needs. Select Vintage Crayola Panel at checkout. This authentic period style was inspired by old fashioned train car lettering & coffee tins. Mark Searfoss designed the letters with a bold appearance, yet allowed for ample space inside the letters for easy readability. In addition to the Regular version, this 8 part set includes 2 Block Shadow fonts, a Lined Shadow font and 4 Decorative Inset fonts. Retro car emblem inspired style from Patrick Kalange. Set includes two fonts for your choice of wide or close spacing. Bonus: You'll also receive Patrick's special Chrome Effect Smart Object for Photoshop free. This updated set includes 3 versions: Flash Script 1 with large decorative caps, Flash Script 2 with smaller casual caps, and an all new Swash version with each letter corresponding to a unique swash. Denise Bayers' modern spin on a Gothic style. Includes a separated lined drop Shadow font as well as 2 newly updated & stackable block shadow fonts. LHF Phantom is a perfect balance of graceful curves and sharp corners. 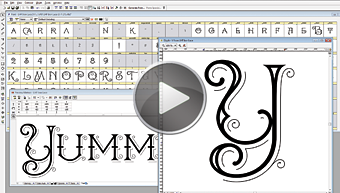 In this short video Patrick Kalange shows how he uses Adobe Illustrator to add decorative elements to letters in his upcoming font LHF Iron Lace. This unique set from veteran sign artist, Steve Contreras includes Regular and Bold weights with separate Inset fonts to make it easy to change colors quickly. Each font contains over 180 alternates, so we've included Glyph Copier versions to help those using applications without a glyph palette access them. Based on lettering from Henderson's Modern Signwriter book from 1895, Signwriter Roman is a complete, well-balanced font with added spurs and other important modifications. Includes 2 versions. There is a free update for customers who purchased before 7/31/17. View update details. A big thanks to the winners of our re-name contest: Luke Scott for suggesting that we rename "Banshees" to "Bandolier" and Cliff Butner for suggesting we rename "Chaparrale" to "Folklore". For their help, they receive a free copy of the fonts. Thanks to everyone who participated. Any designer doing classic designs will find this set to be very versatile and a time saver. A free update for customers who purchased before 6/5/17 is available. This update contains essential improvements. Click here for details. From the imagination of John Studden and Patrick Kalange comes this authentic vintage lettering set inspired by mirrored glass signage. Font set includes 4 multi-part versions, Inset, Regular, and 2 Block Shadow versions which can be stacked to get a "split-shade" effect. Designers who appreciate classic lettering will enjoy the unique decorative flourishes on the caps of Pandora. The lowercase has been carefully designed to compliment these uppercase letters. You receive 4 fonts: Regular, Shadow 1, Shadow 2, and Inset. Free with purchase of $99 or more, download these ready to use vector dimensional letters. Quickly drag and drop them into your designs. Contains CS and Legacy versions with full alphabet, numbers and punctuation. 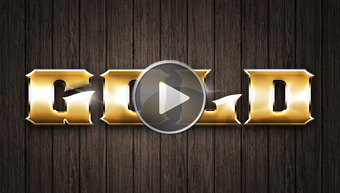 Download this free gold effect designed by Patrick Kalange for Photoshop. Simply change the text to any word you want. Shown here with Roebuck, the effect works with any font. This masterfully-crafted typeface from Steve Contreras, contains over 1000 beautiful glyphs including several OpenType features and ligatures. Inspired by the 20's and 30's, this Art Deco style font from Denise Bayers has a light, jazzy feel. Set includes Regular, Inline & Shadow versions and an Extras font containing decorative panels and corners. This font has a free update for customers who purchased before 2/14/19. Please follow these steps for updating your fonts. This friendly and relaxed font from veteran sign painter Jeff Marshall is a brushed, single-stroke letterstyle. Set includes both Regular and Inline versions. Francis Lestingi's latest addition, LHF Duetta, is classic calligraphy in font form. You'll find Duetta to be bolder and more readable than most calligraphic typefaces. Set includes 2 fonts: Regular and Inline. Perfect for any project that requires a personal and friendly touch. Set includes 2 interchangeable versions. Download for only $35. 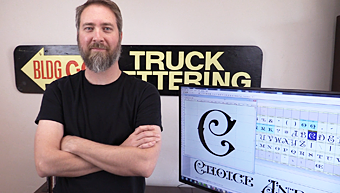 Veteran sign painter Jeff Marshall has been hand-lettering this script for several years. Now, for the first time, dazzle your own clients with this useful, eye-catching script. Authentic period style inspired by old coffee and cigar box labels from Mark Searfoss. Set includes 6 fonts to be creative with: Regular, Shadow & 4 Insets. Signmaker 2 from Dave Correll is here. Set includes 6 fonts, including 3 Inlays, and a Spurs version. LHF Elixir includes 4 fonts: Regular, Shadow, Inset 1 and Inset 2, each with over 50 bonus alternates. This style was popular around the late 1800's. Very versatile and easy to read. Includes full punctuation, accent characters and numerals. Inspired by the classic Indian Motorcycle logo. Includes two fonts: LHF Indian Script 2 and LHF Indian Script 2 Swashes. The Swashes include 52 unique accents designed to attach to the ends of the Indian Script Letters. Dave Correll crafted his new font to have bold flowing strokes which taper to sharp ends, giving it a hand-lettered feel. Includes separate Cornbread Casual Inline font so you can change the color easily. Lovers of beautiful calligraphy and type will especially appreciate this elegant font family from John Davis. Set has 10 fonts and 19 bonus alternates. This 60's-era font set from Denise Bayers features lowercase letters set slightly lower. Alternating between upper and lowercase will give you a fun, bouncy feel. Part beatnik, part cowboy, this versatile set from Denise Bayers has a 50's/60's vibe with a Western flair. Set includes 5 fonts. Free update for customers who purchased before 12/21/2015. 3 extraordinary typefaces inspired by period style billheads and letterheads. Each typeface is uniquely different, yet they have also been designed to interchange with one another. 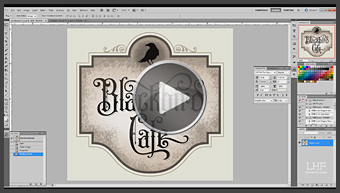 Patrick Kalange demonstrates how to make a vintage design using LHF Elixir by new contributor Mark Searfoss. Beautiful and ornate style, perfect for book covers or posters. Features ornamental caps on upper and lowercase letters. See more examples. Set now features new Distressed and Shadow versions for a total of 4 fonts. Free update for those who purchased before May 4th. Simply login to re-download. Download this free vector scroll panel with any purchase. Expertly drawn by Patrick Kalange. Select Sanborn Panel 1 at checkout. 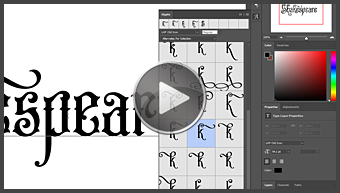 Patrick Kalange demonstrates how to make a vintage design while accessing the alternate characters of LHF Old Iron by Steve Contreras. 2 fonts consisting of the best old fashioned ornaments from Mike Jackson & Golden Era Studios' "Americana Collection CD". Each font contains 36 expertly drawn decorations, corners and accents for a total of 72 ornaments. Denise Bayers' late 1800's inspired multi-part font features 4 versions. Regular, Shadow, Spurs and Full (Shadow and Regular together). Dave Correll brings back the good ol' days of sign painting, when all a man needed was a few cans of paint, a bottle of turps and 2 or 3 quills. Today, this versatile 2 font set is your modern day signkit. Old Stock is inspired by lettering seen on old stock certificates. Chuck Davis designed this commanding font to have thick strokes so you can apply bevels and other creative decoration. John Davis was inspired by the Boston Red Sox logo, which itself is modeled after old circus poster lettering from the late 1800's. 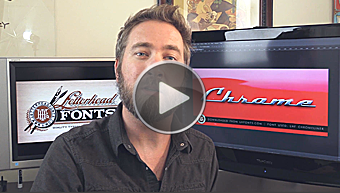 62 hand drawn "Thes" expertly crafted and ready for your designs. Each letter corresponds to a different "The" - a useful addition to the designer's toolbox. John Davis' useful set includes 4 fonts that work together to create quick and professional monogram designs. Old Tom from Tom Kennedy, is a condensed vintage style originally inspired by a late 1800's "French Condensed" sign painter's style. LHF Bella Vista is perfect for designs requiring an air of sophistication. Set includes Regular, Shadow and Inset versions. Patrick Kalange designed this Art Deco style font to be widely spaced, allowing for the subtle beauty of the letters to shine. Download this free vector scroll panel with any purchase. Expertly drawn by Patrick Kalange. Goes well with our LHF Bank Note font. Inspired by the old Packard car logo, this set includes 3 fonts: LHF Packard Script Regular, LHF Packard Script Fancy and LHF Packard Script Swashes (to attach to the ends of the letters). This hand-lettered script from Chuck Davis, looks especially nice when used in conjunction with bolder letter styles for good contrast. Denise Bayers gives us this modernistic style, complete with sharp corners and eye-catching, bold letters that command your viewer's attention. Includes Convex version. A classic Sign Painter's Gothic developed by Greg Reid and Charles Borges. LHF Workhorse utilizes Contextual Alternates to create random variations of the capitals and lowercase letters. Retro style script that naturally draws attention. Includes 2 versions and alternates. Inspired by an old stock certificate, Boot Camp includes 7 versatile and easy to read fonts. In both distressed versions, upper and lowercase letters are different giving designs with repeated characters an authentic aged look. 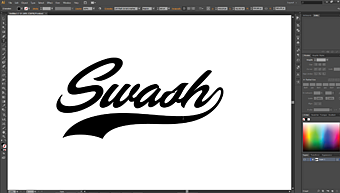 Great for all forms of advertising where a brush script is needed. Includes 8 lower case alternate characters, numbers, full punctuation and accents. Denise Bayers' Victorian style font was inspired by an old advertising letter style used throughout the late 1800's and early 1900's. Authentic hand-lettering circa 1950's. Is it a font or hand-lettered? This old sign painter's Gothic from Duncan Wilkie would fool even a trained eye. A must have for sub-copy. 3 fonts included. An old sign painter's Gothic. Reminiscent of hand painted letters from the 40's and 50's. Ideal for sub-copy. Over 70 of the finest panels from Mike Jackson. Each letter generates a finished panel, so all you need to do is add text and color. Fresh off the brush and into your computer. Your sure to find lots of uses for this bold and lively script from sign artist Dave Correll. An authentic Western style set featuring 3 different versions: Regular, Spurs, & Fancy. Small caps differ slightly and are raised a bit higher than the uppercase letters. Denise Bayers' stylish font has top and bottom spikes to give it a masculine, Gothic appeal. See all 6 styles. Inspired by an early 1900's handbill from the Hamilton Bank Note Engraving & Printing Company. This font is the first of two fonts inspired by that handbill (the other is Hamilton Nailhead). Only from Letterhead Fonts: Set of 26 catchwords crafted from several of Charles Borges' fonts. Add these to your favorite fonts for extra impact. Sign painter Brian Grant and Charles Borges bring you this unique Western style reminiscent of truck lettering from the 70's. Have fun experimenting with 185 bonus alternates! John Studden and David Parr bring you 2 different Sanborn Map style fonts. Get them separately or as a set. Extended Western font with 3 different decorative insets and a 2 part shadow effect. Watch the tutorial. Inspired by advertising tins and signs of the early 1900's with all the quirks of hand lettering. The show "Hell on Wheels" is definitely eye-candy for lovers of period type. We're proud that Letterhead Fonts were used for several signs on the set. Sad to see this show end. This unusual Art Deco style is inspired by legendary sign painter E.C. Matthews. Beautiful fluid flourishes contrast with bold strokes to create an extremely well-balanced typeface by David Parr. A timeless classic with a slight Western appearance. The unusual curves and bends make these letters a focal point. This highly unusual Sanborn Map Company style from Denise Bayers includes Regular and Spurs. Both also feature lined shadow versions. A perfect blend of vintage and modern styles. Bold and readable at any size, which make it great for titles or headings. Inspired by Alf R. Becker, Patrick Kalange has re-imagined this classic 1930's Western style font, complete with new rounded characters and an overall balanced feel. A ragged jagged speedstyle from Chuck Davis. This font is perfect for any mad scientist or extreme design. Powerful square style from Chuck Davis. The sharp serifs in this set draw the viewer in for a second look. Easy to read Asian style set from Chuck Davis. With 2 versions and tons of useful alternates, you'll find many design options. With a total of 67 different ornamental panels, scrolls, and frames, this set is a must have for the professional designer. See more from Tom Kennedy. A new take on a classic typeface. Use this where a condensed sans serif is essential. Includes Regular and Poster versions. Easy to read old fashioned typeface that gives an instant classic feel to any design. Includes 2 versions. This bold Chuck Davis classic is a good choice for book covers, headings and titles. This 1920's era style includes 3 versions: Regular, Spurs and Distressed. Distressed version has been carefully designed to ensure no overlapping points or flaws. 36 hand-crafted old fashioned panels from Mike Jackson. Each letter generates a unique panel, like the one shown above. See them all. A sign painter's script that is used for city & state lettering on Truck doors. Looks good wherever a hand-lettered look is needed. This font has over 243 characters which includes alternates, ligatures and special end characters. Extended style with jumbo decorative caps from Chuck Davis. Beautiful Calligraphic font from Francis Lestingi with meticulous attention paid to the flow of the letters. The words created appear organic and hand-lettered. Mike Jackson's currency typeface is perfect for replicating the style of money and old stock certificates. Authentic Western typeface from sign designer David Parr with 6 styles, giving you many options for creative uses. A unique hand-lettered Calligraphic typeface with hints of Gothic styling. Set includes 3 fonts: Light, Bold & Antique. Ultra modern and crisp. This eye-catching font is perfect for stylish apparel and cosmetic products. Classic Victorian styling makes this the perfect font for refined designs requiring an early 1900's look. Distinctive retro 50's style inspired by an old Zenith radio magazine ad. Includes 6 bonus alternates. Charles Borges created this versatile hand-lettered script with a hint of retro styling and lots of punch. This collegiate-style font is perfect for team uniforms and shirts. Easy to read classic lettering fits just about any sport. Find out how to get it for free. David Parr's creation is a unique, Western style with graceful, well-balanced curves. Features large & small caps with several alternates. Veteran sign painter Pierre Tardif and lettering artist Charles Borges have teamed up to bring you these fun to use retro fonts. Each font includes 108 alternate characters and swashes to choose from. Inspired by E.C. Matthew's, circa 1940's. Includes small caps, numbers, full punctuation and accents. Inspired by Alf Becker, this font by John Davis includes 2 versions: Regular and Inline. Large lowercase letters & bonus automatic ligatures ensure easy readability. Perfect for modern designs. 36 panels from Mike Jackson's "Broadway Collection." Typing each letter generates a different design. Dan Sawatzky and Charles Borges got together to turn Dan's famous whimsical lettering into a font you'll enjoy playing with. Lots of fun! This classic style font by Tom Kennedy was used on old advertising tins in the late 1800's. Includes 2 fonts. This versatile style from John Davis is perfect for projects requiring an easy to read,less formal approach. Nice eye-catching letters good for sales, promotional designs or any application where a more serious typeface would not have the same appeal. Set includes Regular & Italic fonts. An old-fashioned typeface set which includes 4 different fonts: Regular, Fancy, Shadow, and Distressed. Each font includes alternate characters on the lowercase letters, designed to allow you to be creative and choose your favorite letters. Mystery Font is part Art Nouveau, part Fantasy. Set includes 2 fonts with 12 alternate characters and 13 automatic ligatures. You'll find many uses for this highly unusual and creative font. Charles Borges' unusual western style has slightly raised (and smaller) caps on the lowercase keys. Features 22 bonus alternate characters for maximum creativity. Experiment and have fun! 2 fonts consisting of the best old fashioned ornaments from Golden Era Studios' "Main Street Collection CD." Each font contains 36 expertly drawn decorations, corners and accents for a total of 72 ornaments. Carefully distressed by hand (no autotrace or filters used) to ensure an expertly clean result. Contains no overlapping or stray points. Use LHF Distressed Block to easily create aged and worn looking t-shirt designs and unique logos. Originally inspired by a sign painter's Art Deco style, LHF Metro 39 is perfect for designs requiring a period feel. Set includes an Inline version that is reminiscent of letter styles that were used during the 1970's Art Deco revival period. You'll love this Daniel T. Ames inspired font (circa 1883). Highly unique typeface with large & small caps giving it a commanding presence. 2 very happy fun fonts named after the famous SNL parody commercial. Lots of personality and bounce. Perfect for lighthearted applications or designs that need to appeal to kids. Formerly named Cigar Shop, Rawson & Evans includes 2 vintage-era fonts: Rawson & Evans and Rawson & Evans Alternates. From renowned sign artist Francis Lestingi. You'll find many uses for this beautiful hand-lettered calligraphic font. Unusual Gothic style inspired by Sanborn Map Company designs from the early 1900's. This condensed style from Dave Correll features 4 versions. Small serifs and notches on the curves give it a distinct personality. Chuck Davis' unusual modern typeface comes with 2 fonts: Regular and Slanted. Perfect for tech or futuristic designs..
One of four fonts consisting of the best old fashioned panels from Golden Era Studios' "Centennial Collection CD." Each font contains 36 expertly drawn panels. Similar to architect's Speedstyle but with modern touches. Ideal for modern logos and designs. Use lowercase for a friendly appearance and uppercase for a more utilitarian appeal. Originally created for Mike Meyer's Letterhead meet, now you can put this handy font to use in your own projects. Features Art Deco styling, but one of the few styles of its kind to contain lowercase. This 6 font set from Arthur Vanson was inspired by legendary showcard writer and designer Mike Stevens. A smart alternative to Optima with lots of personality. Classic sign painter's casual. Perfect for children's books or light hearted designs. You receive 3 fonts: Regular, Medium & Bold. Bold, extended letters command attention. Includes Convex fonts to create 3D prismatic effects by laying them on top of the Base fonts. John Studden brings us this unique font inspired by an old film title. This condensed style is easy to read and ideal for vertical spaces. A serious Roman font inspired by 30's era sign painter Alf Becker. Features beautifully balanced strokes courtesy of Dave Smith. 36 panels from Golden Era Studios' "Broadway Collection". Typing each letter generates a different design. This easy to read, versatile letterstyle was inspired by Al Imelli's "Advertiser's Square" (circa 1920's). Modifications were made and alternates added. Inspired by Walter Corrie's book featuring illustrations, lettering and ornamental panel designs from 1904-1921. Loose marker style created as a tribute to the Magnum 44 markers used for graffiti. Slight variation of style for the lowercase keys. Bold sans serif font from Rob Cooper. Originally hand-lettered on a magnetic sign for an alarm company. Inspired by a tattoo sign Rob Cooper did in Thailand. Includes numbers, full punctuation and accents. Originally created for a project requiring a 40's retro look. Bold strokes make it perfect for headings and blocks of copy. An old turn of the century style commonly used on billheads, letterheads, certificates, etc. 2 fonts consisting of the best old fashioned elements from Golden Era Studios' Americana, Broadway, and Centennial collections. Each font contains 36 expertly drawn decorations and accents for a total of 72 ornaments. Each letter generates a different design. Another casual retro font inspired by Cecil Wade. Wade Dynamic gives off a friendly vibe without appearing cartoonish. Whimsical serif typeface from Mike Erickson with caligraphy style nicks and cuts in each letter for a hand-lettered appearance. Mike Jackson serves up 62 expertly-drawn decorative ribbons from his Americana Collection CD. A perfect companion to Americana Panels font set. At only 84 cents each, you're sure to find unlimited uses for these old fashioned ribbons. Each letter generates a different design. A fun to use casual style reminiscent of Neuland. Perfect for not-so-serious signs and logos. LHF Silent Movie has been created by carefully studying the styles of lettering artist of the early 1900's. Suggested uses include greeting cards, signs and old labels. LHF Silent Movie invokes a spirit of the early 1900's while remaining quite easy to read and surprisingly versatile. Classic sign painter's workhorse alphabet. Used especially in the early 1900's. All the greats like Atkinson, Imelli and Matthews had their own version. Includes numbers, full punctuation and accents. Yet another beautiful creation from the mind of John Studden. Includes 2 fonts, with full punctuation and numerals. LHF Victoria 2 contains alternate caps. An unusual and fun to use script with many alternate ending characters for a custom hand-painted look. Especially suited for vehicle signage. LHF Springfield is perfect for recreating the look of old stock certificates and letterheads. Inspired by early 1900's Sanborn Insurance Maps published by the Sanborn Map Company. A Modern typeface well suited for applications where an extended letterstyle is needed. Regular & Convex versions. Includes numbers, full punctuation and accents. John Studden created this typeface specifically to match old lettering for the Burbank City Fire Department in California. Includes Regular and Block Shadow versions, full punctuation & accents. Arthur Vanson invented this semi-script with influence from the great Cecil Wade. Chuck Davis' useful easy-to-read typeface with small understated serifs. Well suited for subcopy that doesn't overpower the main message. Inspired by the Casablanca ceiling fan company logos and signage. Spend your time designing, not hassling with inferior fonts. Our Lifetime Guarantee promises that we'll repair any defective font or issue a refund or credit immediately. Rest easy knowing that we've got your back - for life. Details here. Champ features 8 stacking fonts, including prismatic versions. We're shooting for an early April release. Check out Mark Searfoss' other fonts while you're waiting. 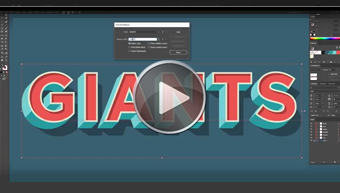 Patrick Kalange shows how to stack multi-part fonts in Adobe Illustrator CS6. Then he shows how to quickly change multiple layers of text, using the "Find and Replace" function. Learn more about our upcoming courses at Northwest Institute of Type & Design. Letterhead Fonts exclusive! This modern style by Charles Borges, contains a whopping 2,583 glyphs and supports over 200 languages. 165 alternate characters allow for maximum creativity for your logos, signs, and packaging. Letterhead Fonts customers get it first. Inspired by "Cosmic" Ray Renooy's iconic "Jade" truck, LHF Jaded features sharp corners juxtaposed against curves & tall vertical strokes. This eye-catching font from Denise Bayers is perfect for truck lettering and signs. Set includes 5 versions: Regular, Shadow, Inset, Inset Shadow, and Spurs. A font with a fade effect? Yes! Just add color. Everything you need to create eye-catching designs with fade effects, shadows, and outlines is included in LHF Scarlet Script from Denise Bayers. Download this 5 font set for only $49. 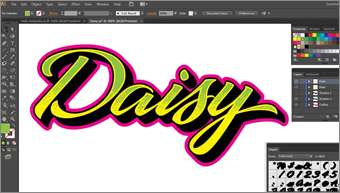 Denise Bayers shows how easy it is to create vector fade effects in Adobe Illustrator CS6, using her new font LHF Scarlet Script. Albury from the talented Steve Contreras has a definite retro 70's vibe that makes it perfect for album covers, posters and generally anything artsitic and handcrafted. 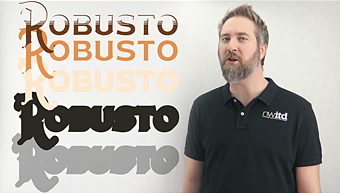 You'll enjoy experimenting with the 4 layered fonts included. Each font includes 49 bonus glyphs and 17 bonus ligatures. LHF Versatile is the long-awaited stacking font set from Charles Borges that stands out with its warm and natural feel. Its generous x-height aids in legibility and function. The forms are modern, yet classic allowing this font to live up to its name as a truly versatile typeface for your next design or layout. For a limited time, download the Complete 21 font set for only $49. Inspired by 1920s era coffee tins, LHF Emporium lends itself to authentic turn of the century designs. Mark Searfoss carefully designed this 11 part set for maximum creativity. You'll have fun experimenting with 3 different types of shadows, 3 insets, and a spurred version, complete with 3 insets of its own. Amarillo2 is the perfect balance of readability and style. Set includes 3 weights: Thin, Regular, and Bold. Each weight includes layered Shadow and Rustic (distressed) fonts for you to be creative with. Special upgrade price for previous customers. John Studden and David Parr collaborated on this friendly, retro style script evoking the spirit of the 50's hand-drawn advertising world. Aussie signwriter Jeff Marshall does it again! Fans of his Jeff Marshall Script will appreciate the hand-lettered touches that make Dixon Script appear as though it flowed right off the brush. Download this fully hand drawn vector .EPS panel free with any order of $99 or more. Expertly drawn by Patrick Kalange. Pieces can be separated as shown to suit your needs. Select J. B. Vaughn Panel at checkout. Lonerider by Chuck Davis is a much-improved version of Fancy Full Round, featuring Regular and Spurs versions in 3 weights: Light, Medium, and Bold for a total of 6 fonts. Denise Bayers has updated LHF Cavalero with an all new version featuring decorative uppercase, complete with an inset version and 2 stackable block shadows. With the addition of this new version you receive 8 fonts total. Mastercraft from Chuck Davis, is one of the most versatile fonts you'll ever use. From its fanciful decorative caps to the easy to read lowercase letters, we're certain you'll find many uses for this unusual 7 part set. Denise Bayers designed the multi-layered LHF Bandolier font set to have a robust yet friendly feel. We're sure you'll find many uses for this hand-crafted font set. Set includes a Regular font and 2 stackable Shadow fonts. LHF Desire by Charles Borges offers an expansive set of over 700 alternates for the designer, making it the perfect choice for books, magazines, packaging, branding and signage. Plus, download Borges Catchwords 1 for free. The sequel to our 62 Thes, these hand drawn variations of the word "The" have been expertly crafted by David Parr, and are ready to compliment your designs. The sequel to our 62 Ands, these hand drawn variations of "And" & "Ampersand" have been expertly crafted by David Parr, and are ready to compliment your designs. A revision of the original Mister Kooky and Mister Spooky fonts released in 2001, these new fonts from Chuck Davis have been completely redrawn and feature lowercase letters. Download free with any purchase over $179. You'll love the hand-lettered, spontaneous feel of Stephanie Inman's LHF Inkling. The long awaited LHF Black Rose Script from Chuck Davis has new updates. This perfect blend of hand-lettering and modern technology is loaded with custom ligatures and alternates. New version 1.2 available. Customers who purchased before May 17th can login to their accounts to download again for free. See list of changes here. LHF Ransom from Denise Bayers is a commanding font with sharp, sloping serifs. Set includes 4 fonts, Regular, Drop Shadow, Block Shadow and Convex. This versatile set from John Studden is inspired by old glass signage. LHF Dublin commands attention with its sharp serifs and unique styling. You receive 8 fonts to experiment with. The original, Atkinson inspired, Antique Half Block font released in 2002 has been completely overhauled. Antique Half Block 2 features extra bonus uppercase characters and all new lowercase characters. Set includes 4 fonts: Regular, Spurs, Rough, and Shadow. This Sanborn Map inspired font from Denise Bayers has bold strokes, sharp sloping serifs and is finished off with a touch of decoration. Set includes 5 fonts: Regular, Overlay, Distressed, Drop Shadow, and Block Shadow. Charles Borges has created 2 new styles of his popular "LHF Desire" font set. "LHF Desire Rough" features distressing around the edges of the letters, while "LHF Desire Ragged" features distressing inside the letters as well. LHF Exclusive: receive Borges Catchwords 1 for free. Don't accept cheap auto-traced knockoffs. You've found the original, high-quality LHF Antique Shop set, first released in 2007 by Chuck Davis. Set includes 4 fonts that work together to create quick and professional monogram designs. John Studden was inspired by early 1900's artist J.M. Bergling. From the mind of Patrick Kalange comes this highly-imaginative font set reminiscent of old cigar labels and classic glass signage from the late 1800's. Set includes 4 fonts: Regular, Inset 1, Inset 2 & Block Shadow. Sharp 4 font set with stylish curves, from Denise Bayers. Includes Shadow versions. Modeled after early 1900's Tuscan style lettering and re-imagined to include a decorative Inset & caps. Set includes 3 fonts. Ken McTaque created one of our most popular typefaces with easy to read, bold characters. 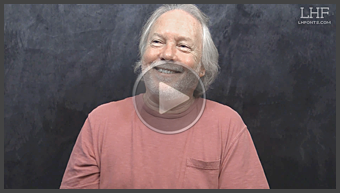 Veteran sign artist & font designer, John Studden, gives a rare interview sharing his history, insights, and methods. Watch the full interview here. Set includes 4 fonts that work together to create quick and professional monogram designs. Inspired by early 1900's artist J.M. Bergling. Styled after early 1900's lettering, Jalopy Joe lends itself to authentic period designs. Set includes 4 fonts: Regular, Distressed, Inset 1 & Inset 2. Inspired from an early hand-lettering style circa 1927 by Samuel Welo. This unusual set from John Studden includes Regular and Shadow versions. John Davis' bold font, captures the letterstyle of the late 1800's posters and traveling circus prints. Set includes 8 fonts. Arthur Vanson made another beauty. You're sure to have lots of fun with this one! 3 font set includes 2 scripts plus an 'Extras" font. Download this Sanborn Map Co. vector panel free with any purchase. Expertly drawn by Patrick Kalange. Select Sanborn Panel 2 at checkout. The letters in this Chuck Davis font have been carefully designed to flow together and interact with each other so well that your customers will probably think you created their design by hand. This latest Sanborn Map Company inspired font from John Studden includes 20 alternates and ligatures. See other Sanborn inspired fonts here. From talented artist Tom Kennedy comes 3 fonts packed with 36 decorative corners each, for a total of 108 unique corners perfect for adding flair to any design. Download this carefully crafted vector cigar panel free with any purchase. 62 hand drawn "Ands" expertly crafted and ready for your designs. Each letter corresponds to a unique and stylish "And" or "&". John Studden's train style font includes 3 versions: Regular, Inset, and Block Shadow. Lends itself well to currency or train related designs. Perfect for your next Rap album. 36 variations of the word "sale" packed into one font. Download it free with any $99 purchase. Tom Kennedy's fun to use old-fashioned script comes with two fonts: LHF Ballpark Script and LHF Ballpark Swashes. LHF Woodmere from John Davis, is a bold, masculine letter style inspired by old fire trucks from the late 1920's. Crisp, clean, and easy to read. Each font Features 21 alternates from artist Charles Borges. Looks good at all sizes. Classic period set from veteran sign artist John Studden. Useful when you need a touch of sophistication. Set includes 2 fonts and bonus alternates. Designing is a breeze with this set from Dave Correll. You get a total of 6 different fonts to mix and match as you please. Modern racing typeface from John Davis includes regular and slanted versions. Both come complete with convex insets perfect for adding depth to your designs. This easy to read calligraphic style from sign artist Dave Correll, was originally created for his own logo. Old fashioned script with hand-lettered appearance. Includes swashes for the ends of words, numbers, full punctuation & accents. Charles Borges took inspiration from old movie and travel posters to make this Art Deco period style font. A rustic and easy to read vintage Western style by John Studden. 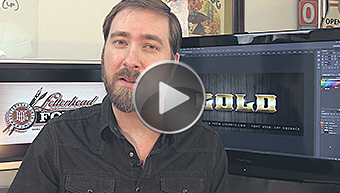 Watch the tutorial for tips on creating fade and line effects. This Charles Borges' script takes full advantage of the Open Type format with several automatic ligatures that occur as you type for a nicer fit. With sharp serifs and bold letters, LHF Roebuck is distinctly masculine. It was used on the 2013 Johnny Cash stamp design by Greg Breeding. See more bold designs. Tom Kennedy wanted to do a collection of thin line ornaments and rules inspired by classic letterheads from the late 1800's. Tom's Engraver's Ornaments 1 features 62 different ornaments. Arthur Vanson's 3 essential scripts that are neither too dainty or formal, yet retain an air of sophistication. Wide strokes allow for many creative possibilities. Veteran sign artist John Studden created this font to exemplify the quirkiness of late 1800's lettering. Uppercase is set below the baseline, adding a hand drawn look. Reminiscent of old stock certificates, Tom Kennedy has created a stunning and versatile font that allows for horizontal stretching. David Parr designed this useful Calligraphic set to have an old-world Middle Eastern feel, but with enough simplicity to use in modern designs. Denise Bayers has added 3 new versions to this decorative font set. Now includes 6 fonts with a new set of uppercase, shadow and inset characters. This Chuck Davis font set allows you to easily create prismatic-styles without any editing of the font itself. Watch the tutorial. Tom Kennedy's old fashioned script was inspired by letterheads from the late 1800's and early 1900's. Set includes three fonts including a swash font. Only from Letterhead Fonts: Set of 26 catchwords crafted from several of Charles Borges' fonts. Included free with any Charles Borges font. A stylized version of gas-pipe lettering, Tallington is bold and commanding. Includes 2 versions: Modern & Traditional. Classic and understated from John Studden, Stunt Roman's elegant and graceful strokes make it the perfect typeface for designs requiring classical sophistication. This latest incarnation of Esoteric features 3 fonts: Regular, Spurs, and Fancy. An easy-to-read Blackletter style from Dave Correll. LHF Divine has a hand-lettered personality that keeps it from being too stiff. A beautiful Roman style that never seems to go out of style. The thin strokes and curves are pleasing to the eye, making it perfect for signs. LHF Handyman from Patrick Kalange, is a fresh take on 1940's traditional Gothic sign lettering. Handy for logos, signs, and poster work. Direct from the hand of Chuck Davis, this completely updated version features all new letters and includes bonus swashes and balloons designed to compliment the letters. Vintage Victorian from Dave Smith. Perfect for achieving a quick formal look. This rustic Western style set from Denise Bayers was inspired by the opening credits and title of the 1957 version of 3:10 to Yuma. In addition to 4 fonts, you get 5 bonus words and scrolls. The original ground-breaking prismatic style comprised of 4 separate sides that give you a realistic 3D effect. Watch the short tutorial and see how easy it is to use. A Roman based grotesque by Arthur Vanson, inspired by the work of Cecil Wade. This type of lettering was used for headlines on showcards and posters from the twenties onwards. Hand-lettered script created with a calligraphic nib. This Chuck Davis original has a rough and loose appearance which helps retain its personal feel. The original Anna Banana font has been completely redrawn and re-kerned from scratch by Dave Corell. Use this fun sign painter's casual for anything from signs to cereal boxes! A sophisticated and serious style from John Davis. The narrow letters make it perfect for book and movie titles. 3 fonts perfect for conveying messages quickly and clearly. Includes regular, shadow, and spurs versions. Delicate strokes and rounded serifs set this Art Deco font apart from the rest. Includes many useful alternates and ornaments. This beauty from Dave Smith gives any design an old fashioned look without overpowering the design or hindering readability. Includes lowercase alternates. John Studden created this vintage Western style to look rustic, while being easy to read. Watch the tutorial for tips on creating fade and line effects. With a 30's/40's era appeal, Fat Cat is ideal for retro designs. Includes alternates. Easy to read letters makes it a nice substitute for fancier scripts. Use where you need a casual yet elegant script. Dave Correll's bouncy bold letters attract attention when paired with a thinner font. Includes a Fancy version. Dave Correll mixed Western & modern styles for this unique Blacksmith set. Comes with free bonus decorative panels and scrolls. Timeless poster one-stroke, variations have been seen since the invention of the poster-brush up to the present. This one was developed from a plate in an old "Signs of the Times" magazine. A traditional Roman typeface done brush style. Inspired by the legendary Trajan's Column. Comes with a bonus Extras font featuring over 50 decorations. Set includes 3 fonts: Flat, Round, and Sharp. The geometrical angles give Conclave its masculine appearance. An assortment of 42 expertly drawn decorative vector panels in the form of a single font. Download the panel above for free. John Studden found a book featuring old photos of fairs and circuses in England and was inspired to recreate some of the lettering seen on the signs. Features 2 versions: Regular and Shadow. A revision of the Outlaw font with cleaned up points, character alterations, new kerning and extras. Includes 3 versions: Good, Bad & Ugly (as an homage to the famous Western). The thick strokes of the letters make this font stand out from other Roman styled text. Includes Regular and Bold, both with capital and lower-case letters for any occasion. Bold, commanding Gothic style with Celtic influences. Perfect for Medieval style games and logos. Pair with some of our Old English fonts for an authentic Renaissance-era look. Dave Correll's retro style font is perfect for adding an 80's flair to your designs. With unlimited uses and a large selection of alternates, this casual script is sure to become one of your favorites. Francis Lestingi's Verdi is a Calligraphic yet bold style that strays from the norm of most thinner Calligraphic fonts. Thicker strokes allow for more opportunity within the letters to be creative. Big Dog is a multi-part prismatic (convex) font. Users type with the base fonts and apply the convex fonts on top. 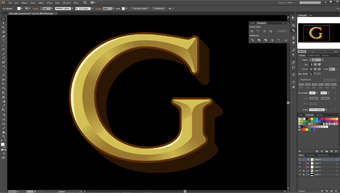 This results in a crisp vector based bevel effect that is easy to manipulate independently of the letters themselves. This 50's style font from Arthur Vanson is suitable for retro projects. Set includes 2 fonts, Regular and the "Extras" font which includes designs and swashes. John Studden's Western style font was inspired by the opening credits of the original 1957 classic film "3:10 to Yuma." Cameo is a perfect substitute for the overused "Copperplate" font and works well where an extended classic typeface is required. A complete revamp of the original Cool Blue font set released in 2002. Features all new styling and improved kerning. Cool Blue 2 projects a friendly, yet professional image making it perfect for logos. This typeface is the solution for creating old fashioned designs where a hint of sophistication is required. Fits perfectly in vertical areas. Original uses for this typeface included stock certificates and bills. Includes 2 versions, full punctuation and accents. Classic hand-lettered typeface. Often (however misnamed) referred to as "signpainter's Gothic." Set includes 4 styles : Regular, Bold, Slim, and Light. A refreshing alternative to the over-used Helvetica styles. A utilitarian typeface with a twist. Created by graphic designer Mike Erickson. Inspired by an antique theater poster from the early 1900's, Novela is a one of a kind style that's perfect for designs that need to project class and sophistication. Nearly a year in production, Confection is a truly inspired and masterful work. Set includes 4 different versions designed to be used together. Each font includes bonus alternates. Retro-inspired font set from sign artist David Parr. Includes 6 different versions with 15 bonus alternates on seldom used punctuation keys. No doubt you'll find many uses for these eye-catching scripts. Handy 40's/50's style inspired by sign painter E.C. Matthews. Perfect for logos and posters. Features small serifs for streamlined readability. 36 of the best old fashioned panels from Golden Era Studios' "Main Street Collection CD." A terrific collection of 6 authentic Old English typefaces from Arthur Vanson. Inspired by an early 1900's handbill from the Hamilton Bank Note Engraving & Printing Company. Inspired by a 1940's "Century" record. This fun to use font from Tom Kennedy is great for anything. David Parr's Sanborn Thin font set is inspired by the Sanborn Map Company's 1909 insurance map catalog. Set includes 2 fonts: Regular & Shadow versions. Arthur Vanson brings us this unusual style with lots of personality. Especially well-suited for showcards and banners. But with it's distinct hand-lettered appearance, Opening Night can be used for a variety of projects. Fun to use casual Western style from Chuck Davis. Letters are staggered (some are higher than others) for a loose hand-lettered look. Inspired from an early 1900's certifcate, King Edward includes 4 different fonts for one price. Mike Jackson's bold State Fair is reminiscent of lettering used on old stock certificates and letterhead from the late 1800's. With its extra wide letters and ornate features, State Fair commands attention. Download the complete 3 font set and receive the State Fair Panels font free. Art Deco style, inspired by 1940's era sign painter Alf Becker. Includes 7 fonts. A modified version of Fancy Full Round suggested by fellow type designer Mike Erickson. Includes numbers, full punctuation and accents. Veteran sign painter Dave Correll brings us this eye-catching font. Curved serifs on each of the letters make it highly unique, giving the font a rugged, western feel. A Gothic style typeface with a lot of personality. A nice alternative to the commonly over-used Gothic fonts. Chuck Davis taps into his hillbilly roots to bring you this fun distressed casual set. Includes two fonts with special (patent pending) "Ho-down" technology: alternating upper and lowercase letters by TyPiNg LiKe ThIs will juggle the letters up and down. John Studden modeled these letters after the old Hastings & Co. gold leaf packs from the 1800's. Small caps are designed to appear raised like the original logo. Enjoy this one of a kind custom creation from Chuck Davis. Beautiful curves make it a must have. Features a few automatic substitutions for those programs that support them. Great casual style from Dave Correll that can be used at small sizes. Lined and solid versions work well together as both main and secondary text. Set includes 4 versions: Regular, Fancy, Inline and Fancy Inline. An old fashioned pre-1930's style, useful for replicating the look and feel of antique advertising. Inspired by an old sign lettering book. Includes several alternates. Bold Art Deco style featuring variations on the lower case keys and multiple alternate characters. This Dave Correll script features sharp edges for bold, attention-grabbing results. Goes well with our racing package. 37 panels from Golden Era Studios' "Saratoga Collection". All 37 of these panels are exclusive to Letterhead Fonts. Typing each letter generates a different design. Inspired from an old cigar label. A fine piece of craftsmanship wrapped up nicely within 2 fonts. Regular and Outline versions with alternates. John Studden's highly unique typeface was inspired by the "Shopfronts" book which showcases various shopfronts and signage throughout England. With late 1800s appeal, LHF Preston has a bold and classic look. Includes numbers, full punctuation and accents. Art Deco style inspired by signpainter Alf R. Becker. Includes lowercase letters in 3 styles: Regular, Shadow & Outline. 39 panels from Golden Era Studios' "Saratoga Collection." All 39 of these panels are exclusive to Letterhead Fonts. Typing each letter generates a different design. A classic Roman style from Tom Kennedy inspired by the 1895 edition of Henderson's Modern Signwriter. An excellent example of early 1900's sign artistry, brought back to life by Mike Jackson. LHF Henderson is an easy to read Western style that lends itself well to subcopy. Retro casual style from David Parr. Unusual boxy serif style lends itself to a wide variety of uses. Subtle bowing in of the letters and serifs gives this font its unique hand-lettered personality. Dave Correll's 2 font set was created to be legible at nearly any size. Has a personable, organic feel without being cartoonish. The bold letters of this late 1800's style catch the eye and allow you to be creative with bevel effects or ornamentation inside. Highly unusual style from Chuck Davis. Useful for truck lettering or race cars. Set includes 4 fonts, all with uppercase, lowercase, full punctuation and numerals. John Studden's variation of a classic Roman style inspired by the Trajan Column in Rome, Italy. Includes 7 bonus alternates for variation. Old fashioned style from Dave Smith. Inspired by an old cigar label we found. Easy to read at small sizes. Terrific Calligraphic style from Rob Cooper. Nice for semi-formal applications. Includes numbers, full punctuation and accents. 2 fonts consisting of the best old fashioned ornaments from Golden Era Studios' "Broadway Collection CD." Each font contains 36 expertly drawn decorations, corners and accents perfect for creating unique panels and borders. Two fonts: Regular & Shadow. Includes numbers, full punctuation and accents. A handy 50's era "Stovepipe" style you're sure to find lots of uses for. Two different styles on the uppercase and lowercase keys. Glass artisan Dave Smith brings us another Victorian era classic. Many possibilities can be achieved by mixing caps with small caps and altering the sizes. John Studden's Western style font is inspired by the title screen of the 1950 film "Winchester '73". John Studden cleverly combines both elegance and rugged Western styles to create LHF Saddleback. Henderson-inspired typeface from the early 1900's. Includes 2 fonts. Beautiful enough by itself, this set also includes two special fonts: LHF Western Rose Outside and LHF Western Rose Inside. These 2 fonts are intended to be used together to create decorative effects in the letters. Using two separate fonts allows you to change the color easily without the need to break apart the letters. Unusual condensed style from legendary sign artist John Studden. Bold, strong letters with thick strokes allow for numerous design treatments such as lines or bevel effects.